In 1492 Columbus sailed the ocean blue. He set out on a bold new mission to reach out to new civilizations and boldly go where no one had gone before. Or was that Star Trek? Either way, when many of us were in grade school, we were taught that Christopher Columbus discovered America. Some of us, if we were lucky, were taught that he thought he had discovered Asia since he had been looking for a new trade route there to trade for spices. None of us ever got the truth. No Flag, No Country. It’s a rule I just made up. 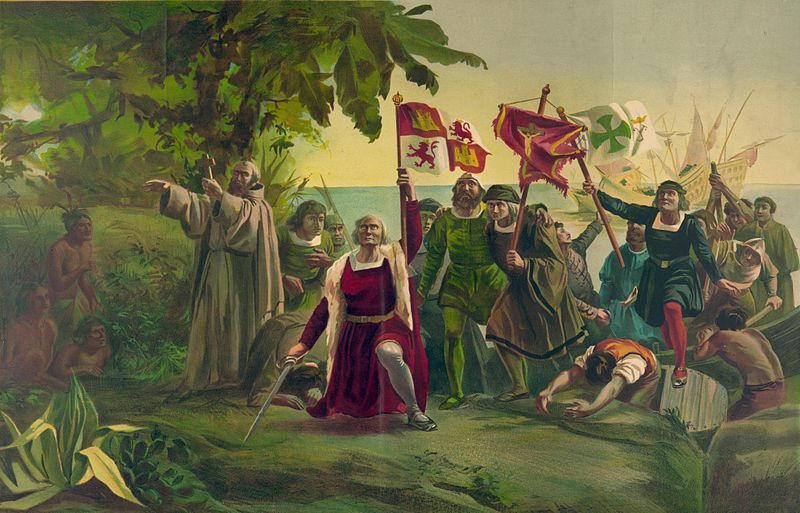 Columbus made his first landfall in Caribbean islands on what he called San Salvador, somewhere in Cuba. He immediately encountered native people, and though he now knew he wasn’t in either Cathay or Chpangu (China or Japan) he had no flipping clue where he really was. He figured he was still somewhere in Asia, but he couldn’t figure out where. Columbus made three more voyages to the shores of what would be called The New World, making landfall in 1493, 1498, and 1502. He even attempted to establish a temporary colony there in 1492 after the Santa Maria was wrecked off the coast of Haiti. 39 men were left behind in an encampment built out of the remains of the ship, however when Columbus returned in late 1493 he found all the men dead and the settlement burned to the ground (Feder 2006). He managed a much more successful colony in what is now the Dominican Republic called La Isabela. How do we know all this as fact and not just more fables told to children in grade school history class? We have evidence. Among the artifacts we have, trade goods, glazed ceramics, nails, glassware, horse gear, metal bits, and dated coins (Feder 2006). All distinctly Spanish in origins. We also have verifiable documentation of Columbus’ travels, court records, maps, journals, and other such documents (Feder 2006). We have lots of evidence that all corroborates. And that’s how we know. There is no dispute that Columbus reached the America’s in 1492, we can back that up. However, there are numerous claims that the America’s were discovered long before Columbus was a twinkle in his mother’s eye. How do these claims hold up? Does the evidence support them? Was someone here before? In this series were going to look over the many and varied claims to the New World, spanning from the Vikings to, yes, Aliens. So let’s start with the most likely culprits, The awesome Vikings! 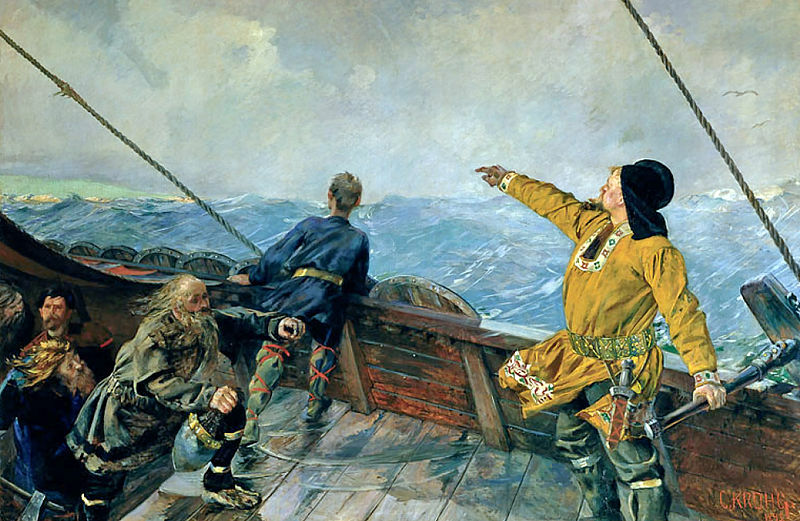 Leif Eiriksson discovers America, by Christian Krohg (1893). The Norse were/are a pretty cool culture, and in my opinion, the coolest. They were culturally sophisticated, socially liberal, and artistically creative. They were kings of the sea, scourges of the land, and the stuff of legends even to today. They left a rich written history behind them in the form of numerous sagas and eddas. Two of those saga’s, The Greenlander’s Saga and Eirik the Red’s Saga, tell of the discovery of Vinland, a land further west then even Greenland and covered with grapes. Leif, the son of Eirik the Red, is the one said to have landed on, and briefly investigated, three new lands past Greenland. He called them Helluland, Markland, and Vinland. He came home to Greenland and told of the vast riches of the new land, Vinalnd. His brother, Throvald, set off to explore Vinland more fully, met up with the natives, called Skraelings, and promptly got himself killed. Around 1022 A.D., Throfinn Karlsefni led a sizable group, consisting of families and animals, from Greenland to Vinland to create a permanent settlement They built homes and farmed the land. Again though, the Skraelings attacked unmercifully and apparently drove the Norse Folk out. What we have here is a riveting tale of discovery and exploration, but as wondrous at this all seems, it’s not evidence Not to mention, we don’t even know where Helluland, Markland, and Vinland are on a map. What we need is physical evidence, and fortunately that’s what we have. Lots of little things have been found along the Northeastern portions of North America. A Norse coin that dates between 1880 and 1235 AD, smelted metal, chain-mail, ship rivets and other non-native goods have been found isolated and within native sties (Feder 2006). These artifacts show contact between the native Americans and the Norse, either through trade, or more nefarious means. 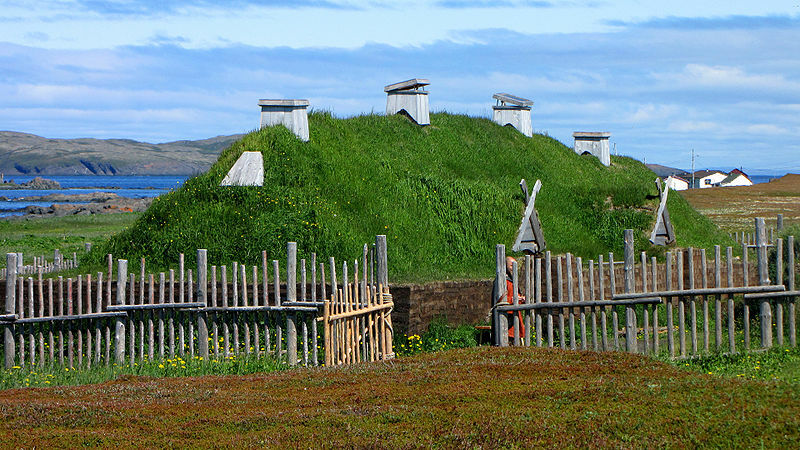 But the big payoff came in the 1960’s in a little place called L’Anse aux Meadows in Newfoundland, Canada. I’ve gone over the tenacious Anne Stine Moe Ingstad and her husband Helge Ingstad previously and their discovery of L’Anse aux Meadow. Here they discovered what appeared to eight typically Norse, turf houses (ArchyFantasies 2012). They worked on the site between 1961 and 1968 and recovered enough information to definitively identify it as a Norse colonial settlement (ArchyFantasies 2012, Feder 2006). The excavation revealed the remains of an early 11th century Norse settlement, including sod houses called “booths”, a forge, cooking pits and boathouses (ArchyFantasies 2012). They also recovered worked iron, bronze pins, a soapstone spindal, and other Norse artifacts (Feder 2006). They also recovered traditional foodstuffs, like butternut shells, a kind of walnut that does not grown in Newfoundland but in Nova Scotia. Carbon dates for the site date it to 920 AD, plus or minus 30 years (Feder 2006). Also, Patricia Sutherland, adjunct professor of archaeology at Memorial University in Newfoundland and a research fellow at the University of Aberdeen in Scotland, has found evidence of a Viking camp on Baffin Island (Feder 2006, Pringle 2012). Things such as spun yarn, whetstones, metals, a whalebone shovel, and even the pellets of Old World rat stowaways from the ships (Pringle 2012). Sutherland’s dates are still being assessed, but the artifacts can be traced to as early as the 11th century (Feder 2006). So we’ve got two settlements loaded with evidence and lots of isolated objects popping up in Native American sites that date to the same times. Honestly, that’s a pretty open and shut case. Score one for the the awesomeness of the Vikings! But the fun doesn’t stop there. We know of at least two locations where the Norse where, but there are many more claims out there claiming “Vikings stopped here, too!” Things like the Vinland Map to the numerous rune-stones found all over the United States. These claims just don’t hold up as well under examination when looked at closely, and what kind of blog would this be if we didn’t look at them? In our next installation we’ll examine the not-so-factual evidence of Vikings in America. 2012 “Women in Archaeology – Anne Stine Moe Ingstad” ArchyFantasies. http://archyfantasies.wordpress.com/2011/09/25/anne-stine-moe-ingstad/. Retrieved Jan 3, 2013. 2012 “New doc aims to unravel an Arctic mystery” The Globe and Mail. Nov. 21 2012 http://news.nationalgeographic.com/news/2012/10/121019-viking-outpost-second-new-canada-science-sutherland/. Retrieved Jan 3, 2013. 2012 “Evidence of Viking Outpost Found in Canada” National Geographic The Daily News. October 19, 2012. http://m.theglobeandmail.com/arts/television/new-doc-aims-to-unravel-an-arctic-mystery/article5540781/?service=mobile. Retrieved Jan 3, 2013. It is highly probable that The Vikings knew all about the Americas. It is also probable that Noah came from Central America and discovered Turkey after a terrible flood experience. Can someone propose a theory as to where the Vikings came from before they traveled to America? I’m guessing your kidding, but if not, I don’t have to propose a theory, we know where they came from before they traveled to America. Thank You for your thoughtful analysis of actual verifiable facts vs. Norse legends.